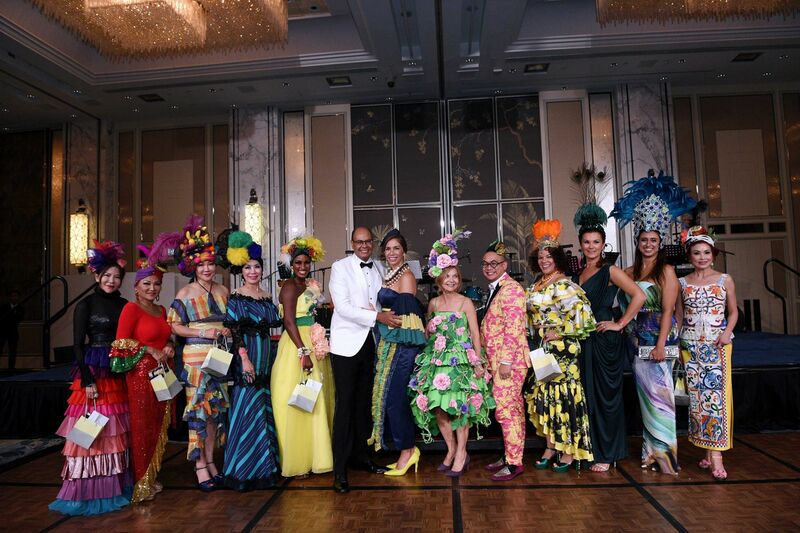 It was a night filled with colour and music at the Muscular Dystrophy Association of Singapore (MDAS) Benefit gala, which was thrown to raise awareness and funds for individuals impacted by muscular dystrophy. The theme was 'A Night in Brazil', which saw guests dressed to the nines in prints, feathers, and fruit—the plastic form of the latter mostly being used to decorate spectacular headdresses. The entertainment for the night followed in the same vein, with Samba music and dance acts, vocal performances by Maya Rasha, and lively piano by Luka Antony Bjelis. The event was also graced by the ambassador of Brazil, Flavio Damico, and his wife Rosa Damico, who graciously took her turn on the catwalk during a millinery fashion show organised by local hat label Eskpade. Fundraising activities followed, including a raffle draw, a silent auction featuring watches and jewellery, as well as a live auction featuring paintings done by members of MDAS. Addresses were given by Kenneth Chan, the president of MDAS, as well as Peggy Jeffs, chairperson of the organising committee and friend of Singapore Tatler.